What Is Palliative Care And How Can It Help You And Your Family? The onset of serious illness impacts a family’s quality of life in so many ways. Patients and their caregivers must cope with debilitating symptoms. They must coordinate appointments and travel to specialists and labs; as they struggle to comprehend new medical terminology and face difficult decisions for treatment options. And they carry all the fears and anxieties that accompany an illness. With a team approach, the Palliative Care Program of Delaware Hospice improves the quality of life of patients diagnosed with a serious illness, and their families, by adding a level of support to the physician’s care. Palliative care helps seriously ill patients who are receiving active, curative treatment. 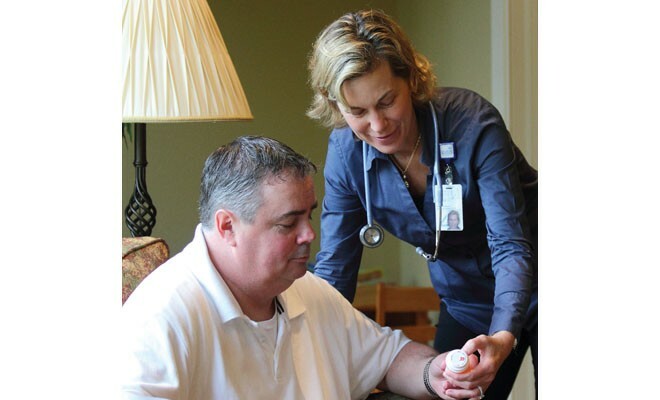 The Palliative Care Program provides assistance to deal with the physical and psychosocial burdens of a serious illness through home visits by a physician, nurse practitioner and/or social worker. The Program is initiated through a consultation from the treating physician. The Palliative Care Team works with the treating physician to manage symptoms and assist the patient to identify goals of care and how best to meet them. Palliative Care of Delaware Hospice is appropriate for anyone at any age, with a serious illness at any stage, and can be provided together with curative treatments. Patients benefiting from palliative care include but are not limited to those diagnosed with cancer, congestive heart failure, Parkinson’s Disease, Alzheimer’s Disease, or kidney failure. Patients can receive Palliative Care, along with the care from their physician, from the time an illness has been diagnosed, throughout treatment and the final stages of the disease. How does Palliative Care help patients? The Palliative Care Team members of Delaware Hospice visit patients and their families in their homes or nursing home facilities—wherever they are. Medicare, Medicaid, and most insurance plans cover palliative care. Why choose Delaware Hospice for Palliative Care? Since 1982, Delaware Hospice has been meeting the needs for comfort and care of patients and families in the community in partnership with medical professionals. Delaware Hospice’s interdisciplinary team members, including nurses, chaplains, counselors, and social workers, are experts in symptom management as well as emotional and spiritual counseling. Delaware Hospice holds accreditation by the Joint Commission, ensuring a quality of care that meets the rigorous standards of the Joint Commission. 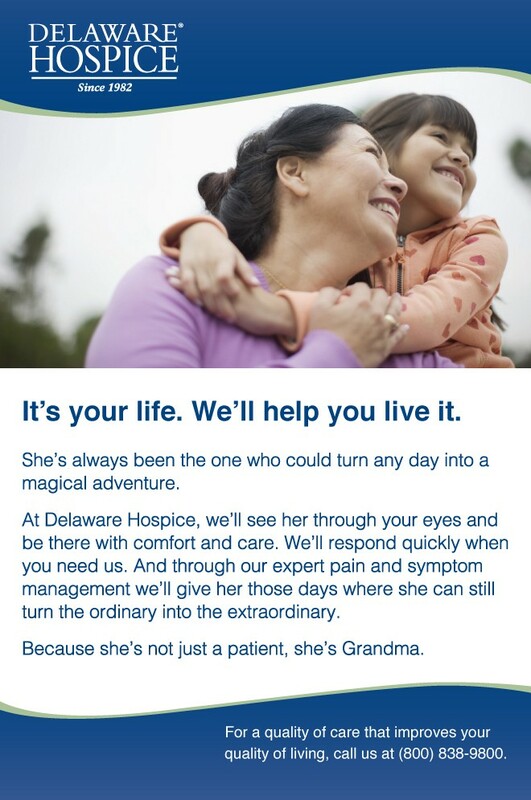 Learn more about the Palliative Care Program at Delaware Hospice for you or a loved one by calling 800-838-9800 or visiting www.delawarehospice.org. *2011 CAPC Research on Palliative Care, by Bill McInturff and Elizabeth Harrington, Public Opinion Strategies. Since 1982, Delaware Hospice has provided exceptional care and support to 46,000 patients and their families. Its mission is to help each patient, each day, live the fullest, most comfortable life possible. Delaware Hospice is the largest and only licensed, nonprofit, community-based hospice serving Delaware and southern Chester and Delaware counties in Pennsylvania. Delaware Hospice is honored to be accredited by the Joint Commission, the nation’s leading health care standards-setting and accrediting organization. For more information about Delaware Hospice’s programs and services, upcoming events, or employment opportunities, call 800-838-9800 or visit our website, www.delawarehospice.org/get-help-now/resources/end-of-life-planning.